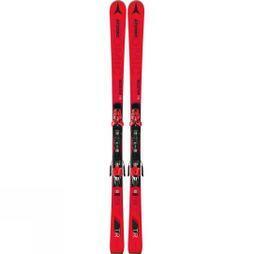 If you love nothing more than skiing groomed runs and working your way around the piste map, then the right pair of piste skis will help you to make the most of every turn. Here are 10 Great Piste skis that are gracing the slopes this season. The Cloud 9 is the little black dress of Atomic’s piste range – elegant, flattering and always right wherever you wear it. 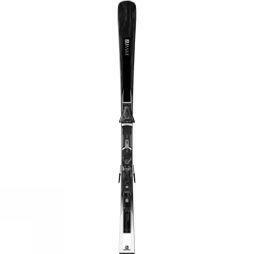 In fact, Cloud 9’s combination of style and substance has made it one of the world’s best-selling piste skis for women. New this year, a Servotec Light on top has been added, giving you extra running stability for even more effortless gliding on piste. With its elegant black and white design and punched leather top sheet, it’s the ski for a someone who is looking for control and easy turning on the frontside of the mountain. The combination of all of the features make it super easy to control: the Piste Rocker makes turning a breeze, while the Step Down Sidewall increases edge grip below the binding. This is a powerful piste ski with no compromises. Aimed at intermediate to beginner skiers, the Speed Zone 7 merges smooth, on-trail performance with a short, easy turn shape for the most comfortable and fluid carving sensation. Our Powerdrive Inside construction offers a balanced, natural flex for more comfortable and accessible on-trail precision and edge grip. Early Rise tip rocker eases turn initiation for playful, energetic carving performance. 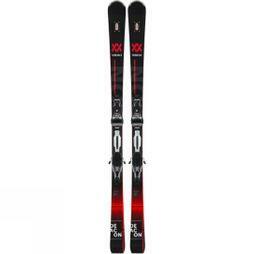 The Deacon 74 from Volkl redefines the way you experience the slopes. This new ski unites an ultra-competitive with a playful concept and allows you to ski super agile and tight turns with maximum creativity. The 3D.Glass construction with speedwall mulitlayer wood core and powered by Titanium comes with a full sidewall and a P-Tex 4504 base. The new UVO 3D provides an incredibly smoothed out ride. The pre-mounted rMotion2 with GripWalk compatibility provides the required power transfer on the 74 mm tip & tail rocker. It’s the latest addition to Atomic’s famous women’s ski line and builds on the effortless performance and style of the Cloud series, maintaining its lightweight premium look, but adding Servotec to increase the ski’s power. Taken from Atomic’s Redster racing series Servotec generates maximum agility in turns and maximum stability at speed. The Limited edition Strato ST is Exclusive to Snow & Rock in the UK. This Rossignol "Classic" is a dedicated on-trail carving machine loaded with horsepower, precision, and playful hard snow performance for expert skiers seeking the ultimate precision and performance. Featuring a Power Turn Rocker profile and new Prop Tip technology for ultra-light swing weight, Strato ST delivers ultra-quick turn initiation and explosive power to snap fast, confident turns across the fall line. The narrow 68mm waist width rolls quickly edge-to-edge while titanal laminate construction delivers power, stability, and smooth-cruising hard-snow performance that brings excitement back to the hardpack. Going fast with more confidence lets you max out the fun-meter. The Salomon S/Max 10 ski is built with Powerframe Ti, a titanium insert and Woodcore for power, precision and control, while the carver rocker eases into turns. If you spend most of your time exploring groomed runs but are yearning to venture into the powder then all-mountain skis are a great choice. They are are all about versatility; fun to ride anywhere on the mountain and brilliant for building confidence off-piste.